The bill passed in November 2016 by a surprising margin, 11 to 2. Mayor Muriel E. Bowser, a practicing Catholic who did not publicly weigh in on the debate, signed it into law despite earlier misgivings by her administration. Saunders knew this moment was coming. It had been nearly four years since doctors had diagnosed Klein’s ovarian cancer. She had shed 20 pounds, her voice was softer, and her hair thinner and grayer. She had decided to stop chemotherapy months earlier. At 70, Klein had become the public face of an effort to legally permit doctors in the nation’s capital to help terminally ill patients die. Even as her health deteriorated, Klein worked for two years to lobby local lawmakers as well as members of Congress — who can overturn D.C. laws — to allow a practice that is now legal in seven states. She prevailed, and the law took effect last year. And now, Klein wanted to become the first person in the District of Columbia to use the law. Saunders picked up a black pen and checked off a box verifying that her dying friend “appears to be of sound mind and not under duress, fraud or undue influence.” She signed her name. Stella Dawson, Klein’s partner of 37 years, stepped out of the kitchen where she was clearing out cabinets and preparing for a contractor’s visit. She offered Saunders a box of macaroni and cheese to take home. “Here we were talking about her death, but we were in the kitchen getting ready to have the kitchen renovated,” said Saunders, an architect. The signature brought Klein closer to fulfilling her goal of controlling the final moments of a terminal disease. But even after the public pleading, the quiet lobbying and the politics surrounding the vote — and the paperwork — it wasn’t a done deal. Klein’s oncologists didn’t want to prescribe the drugs for the fatal dose. And social conservatives in Congress vowed to stop the District’s program. And it was uncertain whether death would come from the cancer overtaking her body, or at her own hands, at her own time and in the comfort of her own home. Klein, a former journalist and artist who trained dogs in retirement, noticed stomach pains while traveling to compete with her German shepherd, Adina, in summer 2014. She blamed her irregular diet and figured she would feel better when she returned home. X-rays dated Oct. 2, 2014, showed tumors growing in her uterus. Klein sat her wife down in their living room soon after and explained the grim outlook. “We’re going to do this well,” Dawson recalls Klein saying. From the diagnosis of the Stage 3 ovarian cancer, Klein was thinking about the end. She wanted to decide when the pain became too intolerable to continue living, but her options were limited. For decades, activists have pushed to allow terminally ill patients to legally end their lives, saying people with no hope of recovery deserve the option to avoid needless suffering in their final days. Some doctors say helping patients die violates the Hippocratic oath to do no harm. Religious leaders say preservation of human life is sacrosanct. Advocates for people with disabilities and the elderly fear they could be pressured into premature death. Even the name of the practice is controversial. Supporters prefer “death with dignity” to “assisted suicide,” and the main advocacy group rebranded itself from the Hemlock Society to the softer-sounding Compassion & Choices. Oregon became the first state to legalize the practice in 1997 and was followed by Washington state and Vermont by the time Klein discovered her cancer. And a 2009 Montana Supreme Court ruling said nothing in state law prohibited the practice. The week of Klein’s diagnosis also marked a turning point for the national movement. Brittany Maynard, a 29-year-old with brain cancer who moved from California to Oregon to end her life, became an international media sensation profiled in People magazine and on national television before her death. Maynard’s story and lobbying by her relatives helped an aid-in-dying bill become law in California in 2015. Meanwhile, advocates were preparing to mount an effort to pass a similar law in the District. It would be a huge symbolic win as the nation’s capital, and the first victory in a jurisdiction with a large number of African Americans, a demographic among the most skeptical of the practice. But they needed a public face. Klein went to her first meeting of Compassion & Choices volunteers in the District on Aug. 9, 2016. She introduced herself to the group as a cancer patient but didn’t say she wanted to end her life. Donna Smith, an organizer with Compassion & Choices, talked about how it needed a persuasive spokesperson for the legislative push in the District. Klein didn’t volunteer. She told her wife about it over dinner that evening. “We joked that a 69-year-old lesbian sure wouldn’t pull at the heartstrings the way Brittany, a young, vibrant woman freshly married with newly diagnosed brain cancer, would,” Dawson said. 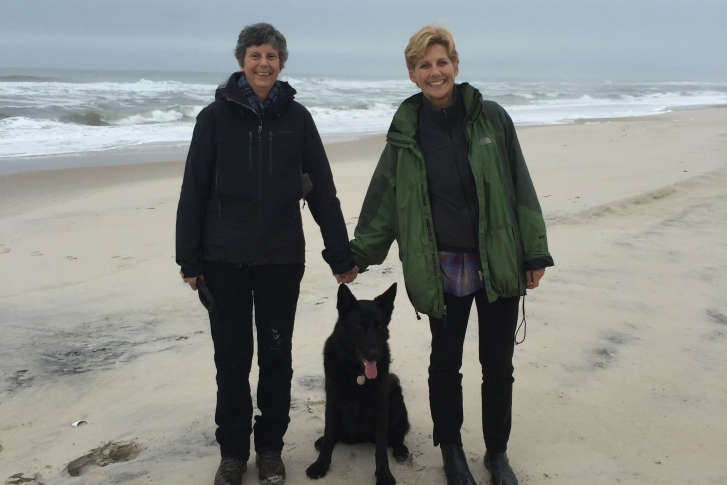 As the vote on the D.C. legislation neared in fall 2016, Klein took a break from chemotherapy, cut short a vacation to Chincoteague Island to lobby lawmakers and gradually stepped into the spotlight. Klein showed up unannounced at a September news conference to rally support for the bill, asking to speak. The bill passed in November 2016 by a surprising margin, 11 to 2. Mayor Muriel E. Bowser (D), a practicing Catholic who did not publicly weigh in on the debate, signed it into law despite earlier misgivings by her administration. Council member Brandon T. Todd (D-Ward 4) had been a firm “no” on the bill until he met Klein. An Episcopalian, he believed life is a gift from God and that only God could take it away. He knew Klein from community meetings and had knocked on her door when he was canvassing for reelection. She asked Todd’s position on the bill; he said he was opposed but agreed to come back and have a longer conversation. They spoke in her living room for an hour, and Todd voted yes. “It wasn’t easy for me to come to the decision,” Todd said in an interview in his office. Klein’s fight to die on her own terms was far from over. Because the District is the nation’s capital, the federal government has the power to void the city’s laws and spending decisions. After failing to overturn the aid-in-dying law in early 2017, Republicans in Congress tried to block the city from spending money to implement it. With the threat of interference hanging over the law, Klein and other advocates called and emailed congressional aides regularly. Locally, the program seemed to land with a thud. A year after the District passed the aid-in-dying law, no one had used it. One challenge was finding physicians to help administer it. The law requires terminally ill patient to make two oral requests — and fill out the written form — for a fatal dose of medication from a doctor licensed in Washington. The patient also needs a second consulting physician. But only two physicians had registered with the city to participate, and their names were kept confidential. Klein had undergone more than 40 rounds of chemotherapy, according to her medical records. She discussed experimental drug trials with her doctors and met with cancer researchers administering them but concluded the risks were far greater than the potential rewards. Still, her doctors had no interest in helping her end her life, Klein said. An old friend recommended a doctor to Klein who might be willing to help because he was open to alternative treatments. They met twice, and he agreed to be a secondary doctor. In turn, he suggested a palliative-care specialist who was closely following the aid-in-dying debate as a doctor who could actually write the prescription. Klein and Dawson visited her a few days later. The doctor’s first question to Klein was: “Tell me about you, not about your illness,” Dawson recalled. It seemed refreshing. After considering it for a while, the doctor agreed to help. The next month, the doctor found a specialized pharmacy in Washington to fill the prescription. The drugs sat untouched in a white pharmacy bag in a cabinet in their study, where Klein also stored old camera equipment. They never discussed how Klein would know the pain had become too unmanageable. The couple joked that they might need a refill before the drugs expired in December 2018, costing thousands because health insurance does not cover the expense. “You just don’t know, with this form of cancer, when there’s a tipping point,” Klein had said. But in the meantime, she planned more trips to Chincoteague Island, more high tea outings at the Willard hotel near the White House and more competitions with her new dog, Eiger. In a trip to Chincoteague over the Fourth of July weekend, she mostly stayed on the couch and read a biography of Joni Mitchell. Her abdomen swelled so much she looked pregnant. She spent days reeling in pain from a catheter draining fluids from her midsection or sleepy from powerful pain medications, according to her diary. On an evening at the end of July, Klein told Dawson that she would take Eiger to Rock Creek Park. She was training him for their next competition, in the fall. Dawson left to pick up groceries and returned to find Klein sitting in an armchair. “I just don’t feel good,” Klein said. She went to bed shortly after. On Aug. 2, doctors discovered that tumors had spread throughout her midsection. Klein asked for her wife’s siblings from Maine, France and England to visit one last time. The next morning, a Friday, Klein fell out of bed and blacked out. Her neighbor Dorothy McGhee, the second required witness for her request for a fatal dose of medication, visited that afternoon and sat by her bedside. They cracked jokes while Klein texted her doctor for advice about painkillers. Adina and Eiger, her dogs, rested by the bed. On Monday morning, Dawson bathed her wife. Her doctor, Katalin Roth, visited that evening. Dawson opened the cupboard and retrieved the end-of-life medication, looking at it for the first time. There were six individually wrapped anti-nausea pills. There was a white bottle of Seconal Sodium, a barbiturate, with 100 empty orange capsules inside. The powder from the emptied capsules sat in a brown bottle, to be mixed with water. At lethal doses, the drug should put patients to sleep and slow the nervous system and organs until they stop functioning. Later that evening, Klein put on a light blue T-shirt that her wife bought in Chincoteague Island. Dawson mixed the drugs with water in a porcelain cup and filled another with cranberry juice to balance out the bitter taste. She brought them to her wife’s bedside. Klein, the nausea medication already circulating in her blood, drank from the cups at 2:15 a.m. and fell back into bed asleep. Dawson curled up next to her. They were alone in their home. At 4:41 a.m., Klein stopped breathing. Dawson placed flowers from the butterfly bush in their backyard in her wife’s arms. Roth later signed the death certificate, citing cancer as the cause, as required by law. Two years after Klein began fighting for an aid-in-dying law in the District, she became the first known person to use it. Her widow keeps the empty capsules in a linen closet next to NyQuil and Pepto-Bismol.